Victor Ioannides lived his whole life near the sea. Therefore he knew, as few do, its behaviour and its relationship with the light. The sea at Limassol, in combination – or not – with buildings, human figures or scenes from daily life, was the subject of many of his seascapes. 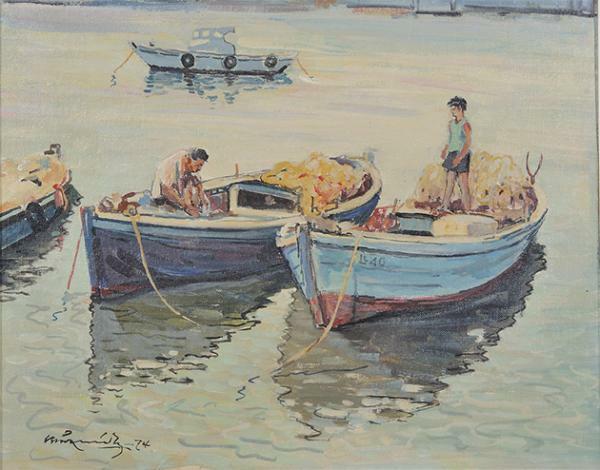 In this painting in the A. G. Leventis Gallery Collection, a typical scene from the life of fishermen is depicted. The painter focused on what is going on at sea. The horizon cannot be made out in the painting, and the coast is merely suggested through unclear lines along its top part. Knowing Ioannides’ painting method, we assume that in this case too he kept plenty of ‘notes’ and ‘impressions’ from nature, which he then elaborated in his studio, taking away and adding elements, guided by his personal principles regarding the creation of balanced and harmonious compositions which are pleasing to the eye; compositions which extol the beauty, the light and the colour of the Cypriot landscape. The iridescence of the light on the water is masterfully depicted in the painting. In order to better render the fluidity of the watery expanse, he used as his medium acrylic paint, which is water-soluble and creates an aqueous colour. The artist composed his work through the contrasts of shades of dark colours for the shadowy surfaces and light colours for the bright ones. The insertion of black brushstrokes breathes life into the bold contrasts of blue and its complementary orange. In keeping with the laws of harmony and contrast, Ioannides achieved that chromatic musicality which creates aesthetic pleasure. He studied at the Athens School of Fine Arts, under Georgios Iacovides, Spyridon Vikatos and Nikolaos Lytras. During his studies, he worked as cartoonist in the newspapers Eleftheros Typos (Free Press) (1923-1924) and Elliniki (Greek) (1925-1929) and as an illustrator for the Great Greek Encyclopedia. In 1930 he returned to Limassol and in 1936 he founded with G. Fasoulioti the first workshop in Cyprus that delt with design and advertising, called Atelie. The pair also issued the satirical newspaper To Gelio (The Laughter) (1936-1937). 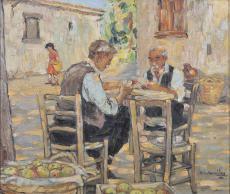 Additionally, he worked as an art teacher in secondary education (1931-1933, 1942-1965). Thematically, his art focuses on landscape, and scenes from everyday life featuring the rural and urban communities. He also painted portraits, still lifes and nudes. He was concerned with capturing visual reality, and depicted his themes with an impressionistic and realistic approach. His personal style is characterized by his skilled draftsmanship and often simplified, free approach to his subjects, perhaps due to his work as a cartoonist. He was particularly interested in technique and spent a great deal of time researching and testing materials, particularly tempera and varnish, in order to achieve the ideal translucency and brightness of colour.